Happy Election Day to all of my readers in the U.S.! I hope that you will all be able to get out and vote. In honor of today’s festivities, I’ve got some patriotic red, white and blue nails to show you. 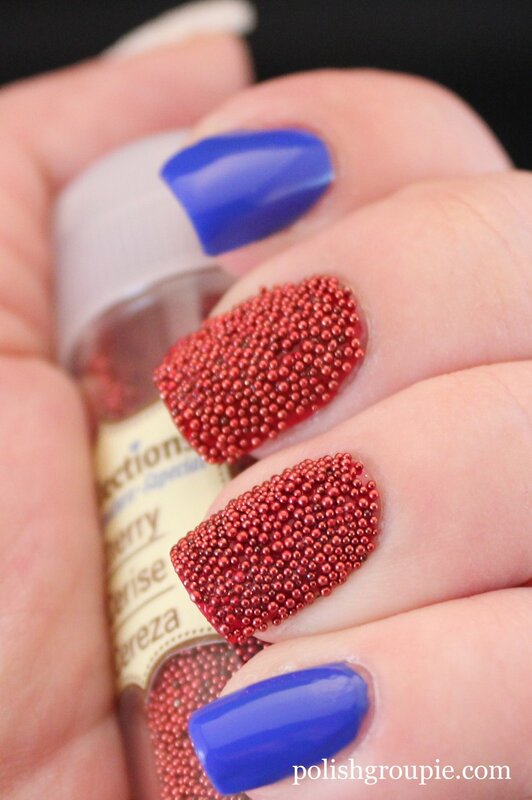 They are blinged up a little bit with some microbeads, also known as caviar nails. Here are the base colors: blue – Nails Inc Baker Street; red – Sinful Colors Ruby Ruby; white – Ulta Snow White and A England Morgan Le Fay. I started with one coat of polish on each nail. For the white thumb, I used Ulta Snow White for the first coat. Then I added a second coat to the blue nails and sealed them with one coat of Poshe fast-dry top coat. Then onto the beads. 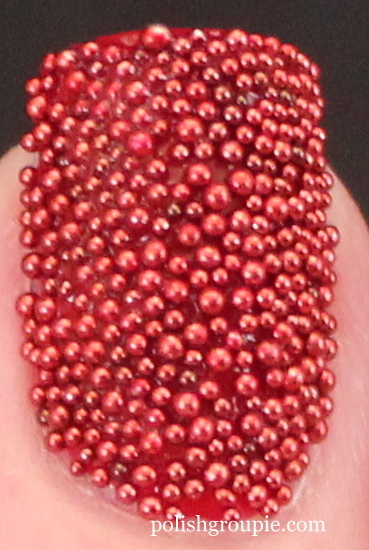 With a paper plate underneath to catch the stray beads, I painted one nail with a second coat of polish and then poured the beads over the wet nail. I gently tamped them down with my finger to make sure they were all settled into one layer and sunk into the wet polish a bit. I then sealed off just the tip edge of the nail with a regular clear top coat. Rinse and repeat. I poured the extra beads from the plate back into the bottle. Make sure the plate is clean before you switch colors or you’ll end up mixing your beads. One word of caution: be careful when you open these bottles. When I opened the first one, the beads kind of shot out and got all over the place. Not the easiest little suckers to clean up!